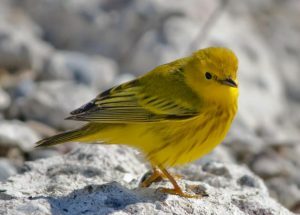 The Yellow Warbler can be thought of as the quintessential Canadian summer bird! It is a small, social, and vocal songbird, with the phrasing of its song described as “sweet, sweet, Canada, sweet”. These birds are almost entirely yellow, with the breast streaked with rusty red stripes, and these streaks appear much fainter on the female vs. a breeding male. Learn more features about this bird in our Tweet of the Week! Each week we introduce a new bird from the Ottawa-Gatineau area through our segment on CBC Radio’s In Town and Out. Alex MacDonald, Nature Canada’s Manager of Protected Areas, shares interesting facts about the birds that live in our communities. Be sure to tune-in to “Bird Tweet of the Week” on CBC Radio One 91.5 FM on Saturday mornings from 6am to 9am and listen to past episodes on our website. This episode aired on Saturday August 13th, 2016.